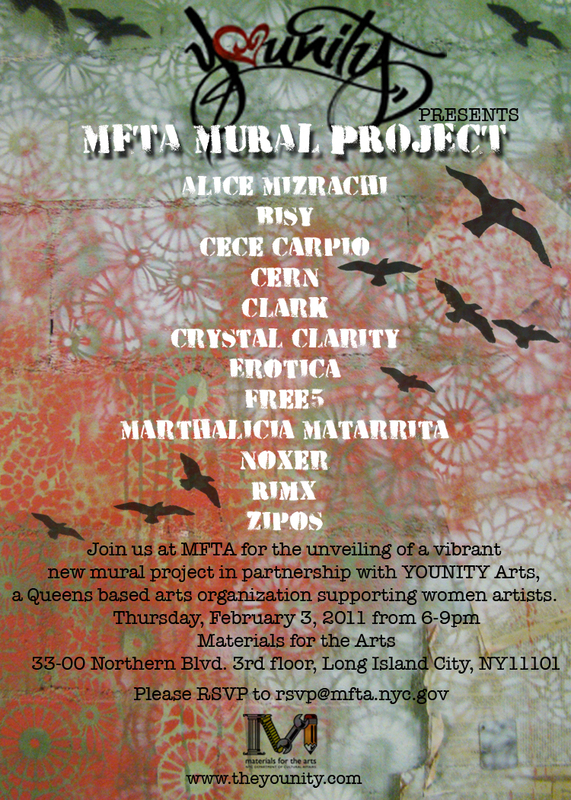 A collaboration between artists Toofly (www.tooflynyc.com/) PattyDukes (www.circa95.com) and Allison Maritza ( F.O.K.U.S ) Aiming to create inspiring environments for women artists where they can celebrate their creative styles in Art, Fashion and Music. Ladies Love Project introduces a model for all women who pay homage to market life around the globe as a staple of community building, and of starting your own independent business. Ladies Love Project thrives on spreading a positive and empowering message to their community especially young women who look up and identify with them. 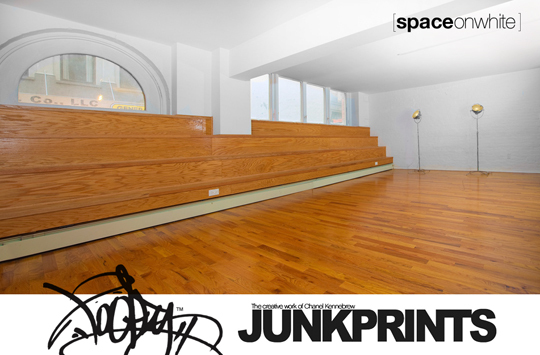 TOOFLY X JUNKPRINTS TEAM UP FOR SHOP CREATIVE! 81 White Street//Tribeca NYC (Btw. 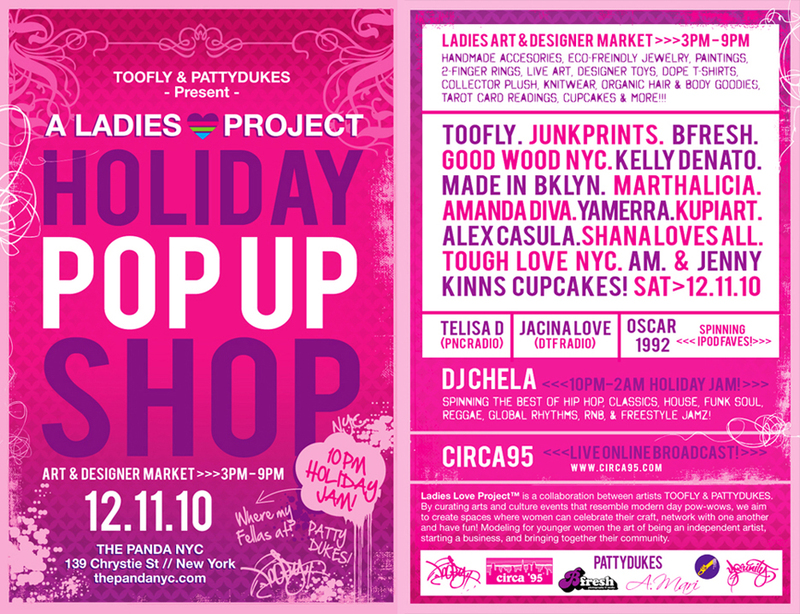 Broadway & Lafayette) Trains to Canal St.
LADIES LOVE PROJECT ::: HOLIDAY POP UP SHOP! Bringing Together Creative Styles in Art, Fashion & Music through a uniquely designed Pop-Up Shop! NEW YORK, NY November 18, 2010 — On Saturday, December 11th, LADIES LOVE PROJECT presents its first HOLIDAY POP-UP SHOP [HPOP] at The Panda NYC from 3 – 9pm – featuring some of NYC’s most creative female urban artists and designers. Join us for this one day only boutique market shopping experience – designed to both encourage female artisan unity as well as provide an inspiring environment for young female entrepreneurs. 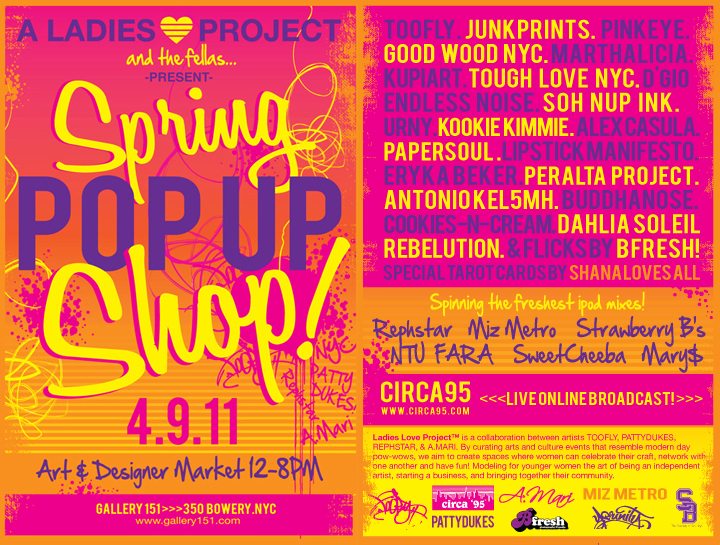 HPOP is proud to host artistas Toofly, Good Wood NYC, Junkprints, and Amanda Diva, among other familiar faces, as they will be exhibiting their one of a kind, limited edition, handcrafted flavors just for YOU! 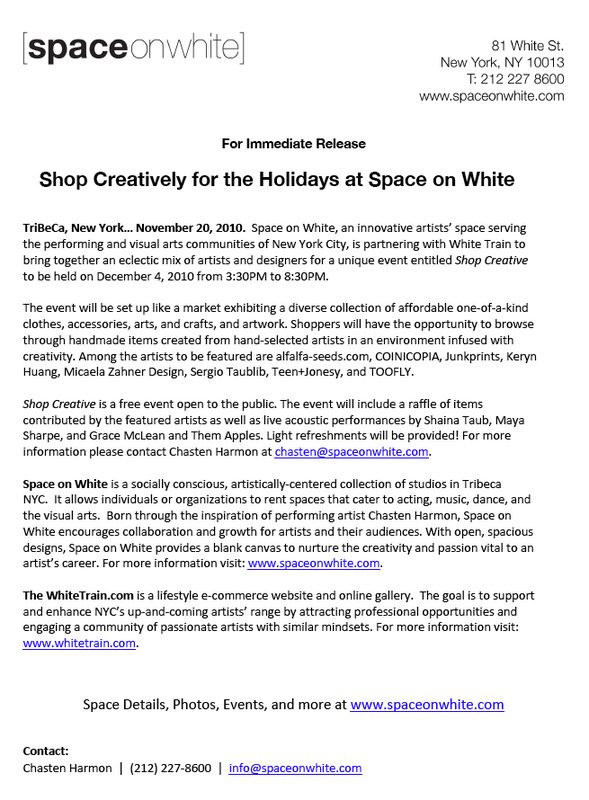 Art aficionados, funky fresh collectors and friends and family members of all ages are welcome to pop-in and shop for holiday gifts + more as these women represent their beautifully unique talents – from canvases to handbags, their roots – all 5 NYC boroughs, and their passion – art. At HPOP, Saturday, December 11th from 3 – 9pm at The Panda NYC – located at 139 Chrystie Street in Manhattan – guests will be able to enjoy a live art performance by Marthalicia, complimentary treats by Jenny Kinns Cupcakes, Photo op’s by Bfresh Photography, and an online live broadcast hosted by PattyDukes and Rephstar from Circa ‘95. 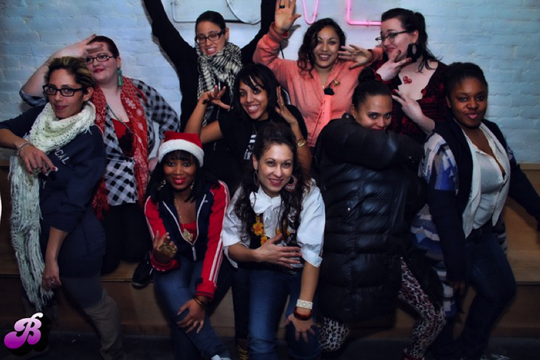 At 10pm, LADIES LOVE PROJECT will keep the energy going with its HOLIDAY JAM – featuring DJ Chela spinning the best of Hip Hop, Classsics, House, Funk, Global Rhytyms and more. Make your Saturday, December 11th LADIES LOVE PROJECT HOLI-DAY – a day for celebrating + supporting artists, women, family and friends! A collaboration between artists Toofly (www.tooflynyc.com/) and PattyDukes (www.circa95.com) Aiming to create inspiring environments for women artists where they can celebrate their creative styles in Art, Fashion and Music. Ladies Love Project introduces a model for all women who pay homage to market life around the globe as a staple of community building, and of starting your own independent business. Ladies Love Project thrives on spreading a positive and empowering message to their community especially young women who look up and identify with them. 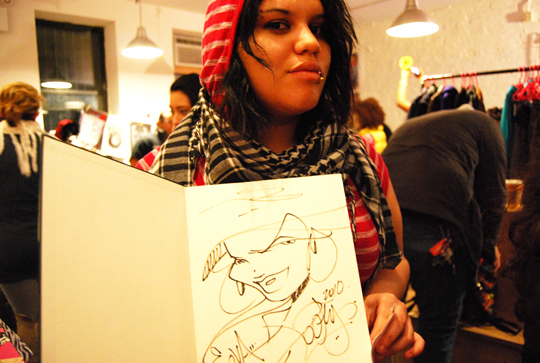 Maria Castillo, Toofly’s birth name is an NYC artist, community builder and entrepreneur. Recognized in the early 90’s for her hard and fluid character style, she gained popularity as one of the few females in a male graffiti dominated scene who rocked walls with the best but also empowered other women to follow suit. 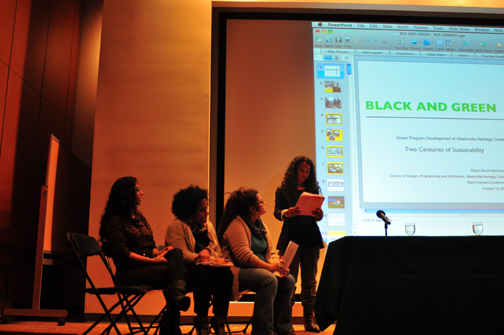 In 2007 she co-founded a 100+ international female arts collective she entitled YOUNITY. Toofly now runs an independent design company called STAY TRU where she consults, designs, and organizes community events and youth workshops. Toofly’s constant and active role in her community allows her to stay true to her roots, as she continues to draw raw feelings from the ever-changing art world around her. Patty Dukes is Co-Founder of Circa ‘95. A Hip-Hop music and media group that curates a daily blog and host an original web series that features innovative urban artists from around the world. Celebrating the best of 90’s Hip-Hop and beyond. Rhyming seamlessly through English and Spanish, the duo PattyDukes & Rephstar are inspired by groups like The Beatnuts, Method Man & Redman and radio shows like the Bobbito and Stretch Armstrong Show. They perform all over the U.S. and have graced the stage with artists like Krs-One, Pitbull, NinaSky and Mala Rodriguez to name a few. HBO Latino is currently featuring them in a show called “RoadTrip: NYC” and “Habla Ya”. They are currently hard at work on their debut album. 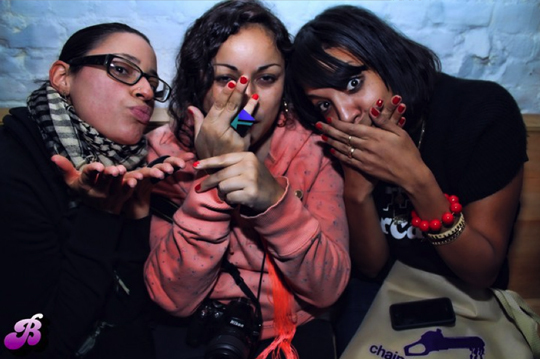 Puerto Rican & Dominican by way of The Bronx and Washington Heights they are poised to make their mark on the world.